A colorful, nutritious and refreshshig salad with great flavors. Perfect for a summer afternoon. 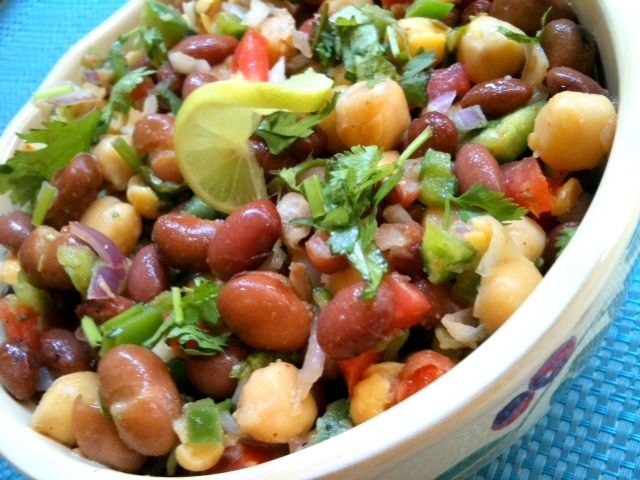 Just toss together some beans along with a few other ingredients and you have a quick and easy beans salad..
1) In a large bowl combine beans, chickpeas, tomatoes, bell peppers and red onion. 2) In a small bowl whisk together olive oil, vinegar, lemon juice, sugar, salt, garlic, cilantro, cumin, red chili powder, hot sauce and black pepper. 3) Pour the dressing over beans and mix well. Let it rest in fridge for 2 hours. Serve cold.